Groups Reported Spending $39 Million On Lobbying State Government In 2017. But Documents Obtained Through FOIA Suggest That Some Money Going To Lobbying Firms Doesn’t Have To Be Disclosed. 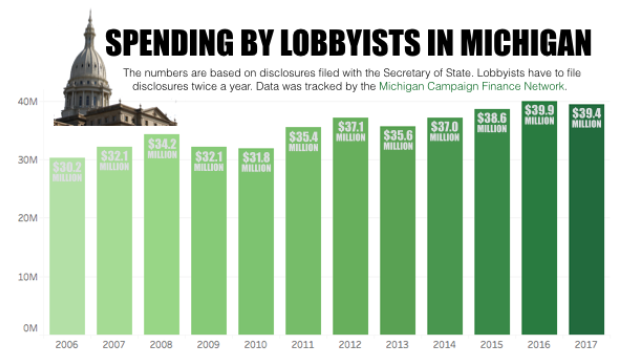 LANSING (SEPT. 4, 2018) — The size and influence of the lobbying industry that’s growing in Michigan’s capital city is likely significantly larger than public disclosures would indicate. Out of 18 public institutions — schools, local governments and universities that have to provide copies of contracts they approve — 16 have been paying Lansing-based lobbying firms larger amounts than they’ve been reporting spending in state lobbying disclosures. Eleven of the institutions have been paying lobbying firms at least double what they reported in official state disclosures. According to lobbyists and government officials, the differences between actual and reported expenditures are legal, explainable and expected. Michigan law defines lobbying as “communicating directly” with certain public officeholders to influence policies. Under that definition of lobbying, expenditures to have lobbyists monitor legislative activity, to make plans for the future and to work on election-related activities could all fall outside what must be reported. — And there is little government oversight to ensure lobbyists are filing accurate reports on their spending. The more than 1,400 groups that are registered to lobby state government have to file their public disclosures twice a year. At the end of August, they disclose their spending for the first seven months of the year. At the end of January, they disclose their spending for the final five months of the past year. The previous two years, 2016 and 2017, saw the most reported lobbying expenditures in state history: $39.9 million in 2016; and $39.4 million in 2017. In the last five years combined, lobbyists and the groups that lobby state government reported spending a total of $190 million. The Secretary of State handles lobbyist disclosures and turns “complete” complaints about their reports over to the Attorney General’s Office, according to state rules. Over the last five years, there have been only two complaints forwarded to the Attorney General's Office by the Secretary of State about lobbyists' reports. State rules also allow the Secretary of State to launch its own investigations into lobbyists’ reports if lobbyists file them late or if identified errors go without correction. There have been zero such investigations over the last five years, confirmed Fred Woodhams, spokesperson for the department. But that doesn’t mean reporting problems don’t happen. Private entities, such as businesses or trade associations, don’t have to disclose to the public the contracts they enter with lobbying firms. However, public institutions, such as universities, colleges, school districts, townships and cities, that fund their lobbying contracts with tax dollars do have to disclose the lobbying contracts if they are requested under FOIA. 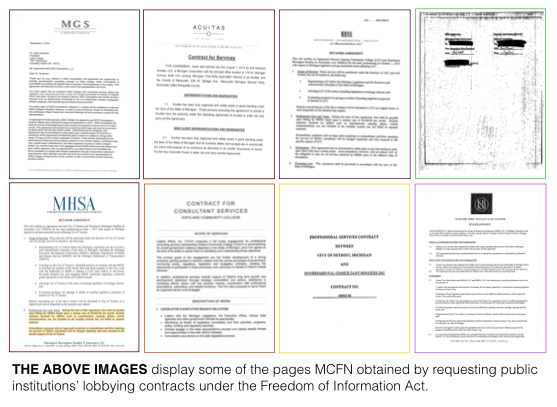 MCFN used FOIA to obtain 18 different public institutions’ most recent lobbying contracts. The largest contract MCFN obtained was between Michigan’s largest city, Detroit, and one of the state’s largest lobbying firms, Governmental Consultant Services Inc. (GCSI). 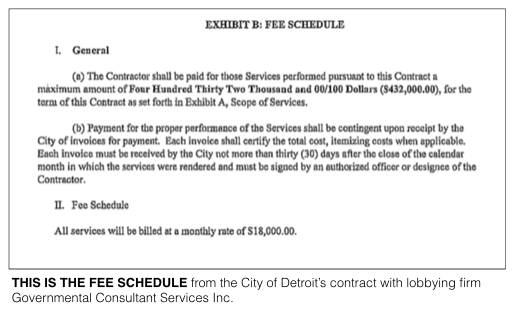 Although this contract is a public document and it’s well-known that GCSI represents the city in Lansing, the City of Detroit hasn’t publicly reported using GCSI as its lobbyist in official disclosures. Under Michigan’s requirements for lobbying disclosure, groups must report the names of individuals and firms they hire to do official lobbying for them at the state level. The only lobbying employee named in Detroit’s reports is Marjorie Malarney. She last filed her own individual lobbying disclosures in 2007. The phone number listed for her in the state lobbying database is disconnected. 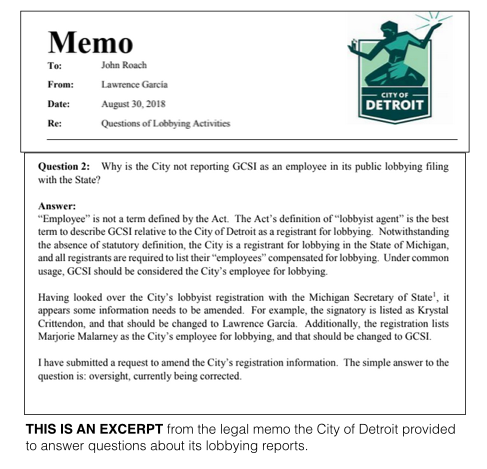 Asked about this, John Roach, Detroit’s media relations director, provided a legal memo from the city’s law department that acknowledged there had been an “oversight” in the lobbying disclosures. In the memo, the city’s law department said it has now submitted a request to the state to change its lobbying registration information. MCFN also obtained a 2014 contract between the county government for 67,000-person Marquette County and the Lansing-based lobbying firm Acuitas. On Aug. 1, 2014, the county agreed to pay Acuitas $2,500 a month for three months. In 2013, the state approved the creation of a new economic development meant to benefit the Upper Peninsula. The contract between the county and Acuitas said the firm would “guide Marquette County on strategy” related to the new development zone. The contract says the lobbying firm would also “direct public affairs lobbying before the governors’ administration, state lawmakers, departments and commissions as needed.” But Marquette County publicly reported spending $0 on lobbying state officials for the entirety of 2014. It’s possible that the lobbying efforts never included official lobbying focused on so-called “lobbyable” state officeholders that would require disclosure under the law. Only high-ranking officials and state lawmakers are “lobbyable” under the law. “I am confused more than anything,” he said of the county reporting no spending on lobbying for 2014, adding that the county doesn’t want to hide anything. And the county has reported lobbying expenditures in 2015, 2016 and 2017. Confusion isn’t abnormal when it comes to the lobbying disclosures. And different groups seem to take vastly different approaches to disclosures. For instance, Pittsfield Township in Washtenaw County hired GCSI to lobby for it in 2016 and 2017 at an annual rate of $36,000. Pittsfield Township publicly disclosed spending that exact amount, $36,000, on lobbying for 2016 and 2017. The City of Lansing has also hired GCSI under a contract that’s describes similar services to the Pittsfield Township contract. The City of Lansing’s contract with GCSI is worth at least $42,000 a year. The City of Lansing reported spending only $11,425 on lobbying state government in 2017. Other groups also reported spending much less than their contracts specify. Lansing Community College signed a contact with the lobbying firm Muchmore Harrington Smalley & Associates Inc. in 2015. The annual rate the college paid the firm was at least $54,000 under the contract. In 2016, the college reported spending just $16,958 on what the state defines as lobbying. For other state officials, expenditures to influence them don’t necessarily have to be reported. For instance, a lawmaker is “lobbyable” but that same lawmaker’s staffer may not be. Likewise, Northern Michigan University (NMU) signed a contract with Michigan Legislative Consultants in 2017. NMU agreed to pay the firm $4,436 per month, which would be $22,180 total for the last five months of the year. For that same period, NMU disclosed spending just $5,724 on what the state defines as lobbying. Kristi Evans, a spokesperson for NMU, said the university’s payment to the lobbying firm covers both consulting, which falls outside of the lobbying disclosure requirements, and lobbying expenses. The bulk of the payment is for consulting expenses, she said. The City of Detroit provided a similar explanation, saying GCSI tracked the time its employees spent communicating directly with “lobbyable” public officials. GCSI then advised the city of the amount of money that should be allocated for disclosed lobbying under state law. In 2017, the city’s contract with GCSI required it to pay the firm at least $216,000. The city reported spending $51,000 on lobbying state government for the year. How different lobbying firms track these numbers and report them back to their clients is unclear. And how the sample of 18 contracts obtained by MCFN compares to hundreds of others for private firms that wouldn’t have to disclose their contracts under FOIA is also a mystery. But there appear to be differences in how groups calculate what they actually report to the public. Some claim to track the numbers closely. One lobbyist who declined to be named because of the sensitivity of the subject said his firm uses a formula based on a percentage of the overall retainer to estimate its reportable spending. He called it the firm’s “best guess” at what it was spending on direct lobbying. Legislators approved Michigan’s lobbying registration law in 1978, forty years ago this year. You can access the lobbying reports filed with the Secretary of State here.